If you were to travel to the world of Seti Rolato, you would be hard pressed to find any of its citizens. Not only are they a shy people, but you would easily mistake one of them for a rock or other natural formation, that is if you could even find one amongst all the foliage on the planet. Seti Rolato is almost completely covered in a sea of green aggressive plant life. It wasn’t until a few years ago that the Galactic Council even discovered there was sentient life on the planet. Because of its heavy gravity, life evolved differently than most worlds. In their natural form, the citizens of Seti Rolato have a very dense epidermis that reacts to the gravity conditions over time. Hence most adults tend to look very blocky in nature, closely resembling walking rocks. Their thick skin also evolved due to the harsh nature of the plants on their world. The roots are unable to tell the difference between normal rock and the inhabitants, which results in a high incidence of death among the young. This has also led to a general animosity towards all plant life on the planet. However, a small group of citizens came to realize that this was just the natural order of things on the planet, and that the plants should be studied to find ways to prevent the plants from encroaching on their homes. Garanti Tulseir was a leading scientist in the group that was on the verge of finding a peaceful way to deal with the unintelligible floral. However her outspoken nature against the wishes of her leaders soon branded her an outcast, and eventually she was forced to leave her homeworld. Undergoing cosmetic surgery to remove her rough edges, she eventually ended up on Earth. 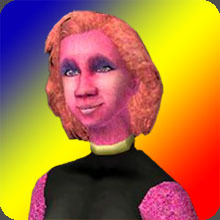 Shortly after arriving she used her knowledge of plant life to setup an exotic florist shop in the suburbs of Pleasantview. Her business quickly flourished and even caught the eye of Emerald Guardian, which led to her introduction to Team Rainbow / Primary Force. Through her association, she was able to help contribute to their efforts, and was eventually offered a position on the team as Magenta Rose.